Sanding discs are used with disc and random-orbit sanders, and are available in a wide variety of diameters, grits, attachment types, hole patterns, and brands to suit different applications and sanding equipment. Sanding discs with holes are designed for dustless sanding in conjunction with a dust extraction system. Five, six, and eight inch 3M sanding discs, 3m sanding disc adhesive, Hookit dustless and dry sanding discs. 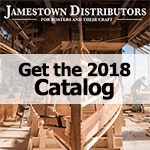 Jamestown Distributors has a sanding disk for any application. Before ordering any discs, check your sander and attachments to determine whether you need hook and loop ('velcro'), or psa backed sanding discs. Different sanders also feature different hole patterns for dustless sanding. For instance, Fein sanders have eight holes, whereas many others have five. We have Norton and 3M discs for both. We also offer replacement interface and back up pads. Glue-on sanding discs will require an adhesive to stay in place. 3m provides the premier sanding disc adhesive.